Your children are continuing to do an impressive job acclimating to the new school year! They are settling into new routines, learning new schedules, making new friends, and taking on new challenges. In short, HMS is a happy, busy, active place these days, and our staff is enjoying each new learning experience with our students! Throughout the school year we will share information and resources with you regarding school/student related issues. This week’s newsletter offers three resources related to school safety, technology, and tips for easing back-to-school stress. As the school year begins, the Maine State Police, the Maine Sheriff’s Association and the Maine Chiefs of Police Association are partnering with the Maine Department of Health and Human Services, Maine Department of Education, Maine Emergency Management Agency, and Maine Fire Marshal’s Office to remind all of the “See Something, Say Something” campaign that is still as pertinent today as when it first appeared. The attached bulletin will be disseminated starting today to many different outlets. The more this is shared the better. We are much stronger and safer working together with our citizens and agencies as one team to keep our children safe in their schools. We have attached this bulletin for your review. We will include a brief message about the “See Something, Say Something” campaign in our Daily Bulletin. 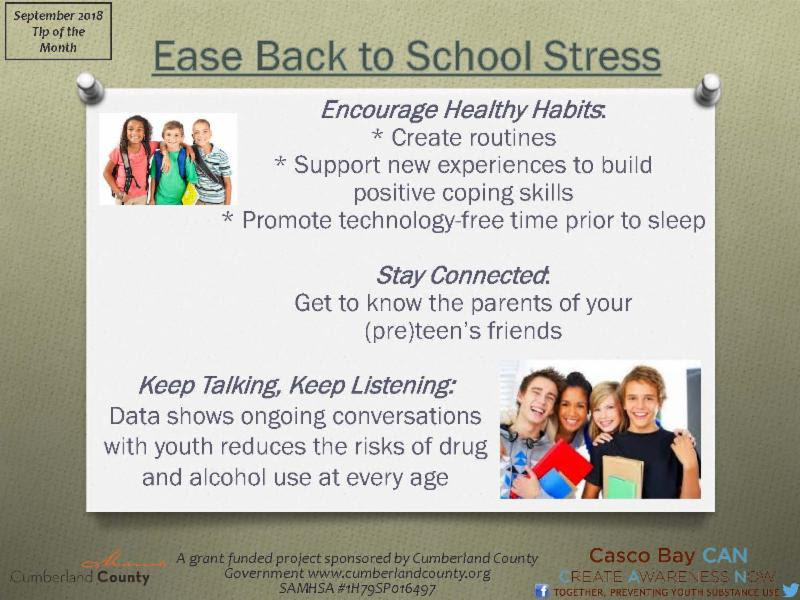 We have also attached a brief article from Screenagers(which offers insights about siblings and screen time), along with information from Casco Bay Can about easing back to school stress. Please take a moment to have your children write their names in their sweatshirts, lunch boxes, water bottles, and anything else that will help us to reunite misplaced items with their rightful owners! Thank you for your help with this. After School Activities- Just a reminder that students staying after school must be in a supervised setting until their extracurricular group or sport begins. Active Parenting Class-September 27, 2018-6:00 - 8:00 PM-6 weekly sessions (9/27, 10/4, 10/11, 10/18, 10/25, 11/1)-there is a $20 fee for the book. Classes will meet in the HMS Conference Room. -Harrison Middle School Influenza Vaccination Clinic-Thursday October 11-Kristina Truesdale, our School Nurse, has sent home information about the clinic. -Student Picture Day-October 23-Just an FYI for now-another reminder and further information coming soon! We have enjoyed seeing you at our Open House events. We look forward to seeing you at next week’s 6th and 8th grade Open Houses!